PCIe 2.0 x8, SAS 2.0 with 6Gb/s throughput per port, 800MHz PowerPC, 512mb cache, Supports up to 127 devices using SAS expanders, 1xSFF-8087 external connector, 1xSFF-8088 external connector. Used with 90 day warranty. SPECIAL PRICING! 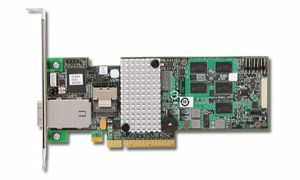 The eight-port 3ware SAS 9750-4i4e controller card provides a new level of reliability, availability, and performance to businesses that are facing storage challenges, particularly in sequential I/O intensive and multi-stream environments. This 3ware controller supports both internal drive storage and external JBOD expansion, while providing a higher standard of data protection and performance with the latest in LSI RAID-on-Chip (ROC) technology. Using the external SAS ports, multiple JBODs can be connected to a server, delivering a scalable and affordable solution for growing storage requirements. Additionally, StreamFusion™+ is designed to deliver breakthroughs in high-load applications and provide enhanced features and functionality in all environments. Offering data transfer rates of up to 6Gb/s per port, this 3ware SATA+SAS controller provides many new features while also ensuring investment protection for existing SAS and SATA implementations. LSI 3ware delivers unprecedented power in multi-stream RAID environments where performance, redundancy, and data protection are most important.